The golf enthusiast will appreciate homemade golf ball Christmas decorations for the home or office. New or used golf balls are combined with craft supplies to make characters and animals for ornaments, plant pokes, wreath or floral arrangement inserts. This versatile project can be used as a guide to create a golfing snowman family to set up on a mantel or window sill. Brighten up the home with an entire collection of animals or North Pole characters made from golf balls. Make golf ball decorations that reflect the personality of the enthusiast who will use them. Paint the golf ball in the color that is appropriate for the character or animal chosen for the project. For instance, brown for a reindeer, light tan for Santa's face, pale pink for an elf or leave white for an angel or snowman. Two to three balls can be used for a snowman. When making a Santa, or an elf, paint a red or colored ball for the coat of the character. Paint facial features onto the animal or character. Paint a circle for each eye, an upside down "U" for the nose and a rounded "W" for a smiling mouth. Paint a small blush-pink circle on the face for rosy cheeks. Paint black button stones on the snowman front. Cut out small heart or round-shaped ears from felt for the animals. Cut out a 1/2-inch-wide strip of felt for a snowman scarf. Cut a thin strip for a band for ear muffs and glue pom poms on each end. Cut a large triangle from felt. Sew the two sides together with needle and matching thread to create a cone shape for a Santa or elf hat. 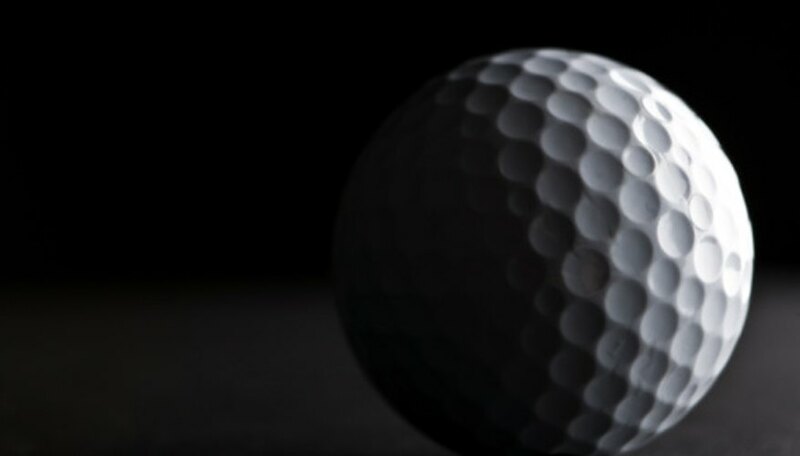 Glue two or three golf balls together after the paint is thoroughly dry. Be sure to use a strong adhesive. Set the balls aside to dry on to a crumpled grocery bag or rag to keep them from separating and rolling off the work surface. Glue the felt ears to the head of the elf, animal or Santa character. Cut 1 and 1/2-inch pieces of yarn and glue them to the head of Santa or an elf for hair. Cover the head with the cone shaped hat and glue it in place. The yarn hair will stick out from the bottom of the hat. Glue white yarn around Santa's hat for fur trim. Glue the pom pom ear muff and band to the head of an elf or snowman. Tie a 6-to-10-inch piece of 1/4 inch ribbon into a loop for golf ball ornaments. Sew the bottom of the loop to the hat of a character. Glue the ribbon loop to an animal ornament. Glue a golf tee to a golf ball animal or character for a plant poke or floral arrangement insert. Paint or write a message on a golf ball with acrylic paint or permanent markers. Write or print the words, Peace, Joy, Noel, Love or Merry Christmas across the center of the ball. Personalize the simple message with a person's name. Glue a silk poinsettia or holly leaf to the top of the ball. Paint a soda bottle cap gold, red, green or silver. Adhere the dried cap on to the bottom of the golf ball decoration for a display stand. Glue weights such as metal washers in a bottle cap for a display stand that supports a snowman. The character will be top heavy without the weights. Be cautious if drilling a hole into a golf ball to insert an eye screw for hanging the project. Older golf balls are filled with rubberband-like materials and a liquid that can blow up when under pressure. Place the ball in a vise grip and wear safety glasses for a precaution against serious injury.